A fascinating tour around Germany to the most famous historical sites, charming medieval towns and castles surrounded by beautiful scenery. Enjoy majestic views from Alpine resorts and visit bustling cities at the North. Depart from Frankfurt to the Rhine valley and cruise along the famous Lorelei rock from Rudesheim. On the north we visit the bustling cities of Hamburg and Berlin continuing south to Munich and the nearby fairy tale castles and Medieval towns to lovely Lake Constance and the legendary Black Forest. Individual arrival in Frankfurt and transfer to the hotel. Rest of the day is at leisure for own activities in Germany's commercial and financial center. Accommodation at the Hotel Mövenpick Frankfurt City****. At 7pm meet your guide for a welcome dinner at the hotel. In the morning we travel to Rüdesheim. Short tour of this ancient wine growing town with history dating back to Roman times After a short walk we board a steamer for a Rhine river cruise, passing by fascinating castles, ruins and the legendary Loreley Rock. Maybe, from the deck of the ship, you will see the blond maid combing her hair. During the cruise we enjoy a wine tasting. Disembarkation at St Goar from where we travel by coach to the 4* Movenpick Frankfurt City for overnight. Today we cross the mighty Rhine river and visit the Alsace region today belonging to France. The region has a unique two-culture atmosphere of German and French influences having been a disputed province between the two powers. The first city we visit is Colmar on the the famouse Alsace Wine Route, a charming medieval town of half timbered houses and canals. We invite you for a typical Alsatian lunch, then continue to Strassburg, the capital of the region, an elegant city and seat of the European Parliament. After a sightseeing tour of the city we return to the 4* Central Hotel Freiburg for overnight. After breakfast we drive to the heart of rural Black Forest to enjoy a short presentation on how the famed cuckoo clocks are made in the region. 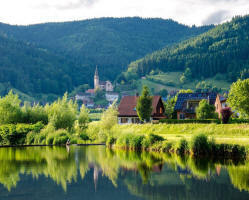 Continue to a small traditional Black Forest farm where we will have a cheese tasting and you will see the real Black Forest. After that we drive to the charming town of Lindau on the shores of Lake Constance, from where if the weather is right we can see spectacular views of the Alps. Depending on weather conditions we will take the Alpine road from Lindau to Oberstaufen and Immenstadt to our final destination Füssen, the small town close to the famous castle of Neuschwanstein. Accommodation at the Best Western Plus Fussen 4*. This morning we pay a visit to Neuschwanstein Castle, the breathtaking fairy-tale castle of King Ludwig II. 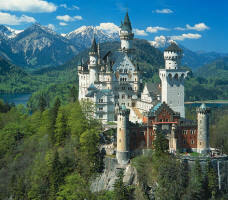 Neuschwanstein was built by the controversial king Ludwig of Bavaria with a shortened and tragic life. At midday we travel to Oberammergau, famous for its Passion Play that takes place in the town every 10 years; also known for its painted houses and lovely crafts. Along the way we visit the pilgrimage Wieskirche Church with tis spectacular Rococo interior before continuing the tour to visit the charming Linderhof Castle. This palace of King Ludwig, II. was his favorite where he actually spent most of his adult life. After a stop at the Ettal Benedictine Abbey we continue on to Lindehof Palace . Return to Best Western Plus Fussen for overnight. After breakfast we drive to Munich, the capital of Bavaria where we will visit the city’s main attractions, concluding the tour at the Marienplatz square with its famous clock tower. Munich, the capital of the state of Bavaria is famous for its Oktoberfest, which is annually celebrated in September. The afternoon is free to explore at your leisure. In the evening you will enjoy a traditional Bavarian dinner. Accommodation at the Eden Hotel Wolff 4*. Today we visit the charming town of Berchtesgaden on the shores of Lake Konigsee, a typical Alpine town surrounded by spectacular vistas of Mt. Watzmann. It is a region of salt mines close to the Austrian border. The area's most famous historical site is Hitler's Eagle's Nest, a secluded mountain retreat. After visit to the top (weather permitting) we drive back to Berchestagen where you will have a chance to take an optional boat tour on the serene Lake Konigsea. Return to Munich for overnight at the Eden Hotel Wolff 4*. This morning we drive to Rothenburg ob der Tauber, one of the oldest and most beautiful cities on the Romantic Road of Germany, a well preserved Jewel from the Middle Ages. See the St Jacob;s Church with the Holy Blood Altar by Tilman Riemenschneider, and get absorbed in the medieval atmosphere. We conclude our visit by tasting the Schneeballen (snow ball) a pastry considered the signature dish of Rothenburg. Continue on to Nuremberg where we visit the historical city center and learned about the history of this important city. Accommodation at The Hotel Park Plaza 4*. After breakfast we visit the Documentation Center Nazi Party Rally Ground. The gigantic remians of the the buildings in the Southern districts of Nuremberg are a remnder of the megalomania of the National Socialist regime. Accross elevan square kilometers , a monumental back drop was to be created for the self staging Nazi Party. Today the unfinished Congress Hall houses the Documentatio Center Nazi Party Rally Ground. Overnight in Nuremberg at the Park Plaza 4*. After breakfast we depart to the Baroque town of Wuerzburg in the northern part of the Franconian region well known for its lavish Baroque palace called the Residenz. Built by the Prince-bishops of the town the palace was an important center of refined culture and was frequented by famous artists, royalty and musicians. We will embark on a tour of the city with a visit to the enormous palace. After the sightseeing we will continue back to Frankfurt, on the way we will make a brief stop at the Mespelbrum Castle. Overnight at the hotel Moevenpick Frankfurt City****. After breakfast, transfer to the airport and end of services. 5% discount for 3rd person in room with extra bed on any date.